A cat painting is the perfect gift for cat and art lovers. Does your cat-loving friend love art and cats? Then consider giving him or her a cat painting. Certainly, cat paintings make wonderful gifts for both cat lovers and art connoisseurs. Other gift options inspired by paintings include art prints, etchings, and even art books. Cats have always been a favorite theme among artists. Indeed, felines have appeared in art since Ancient times all the way through the present. It will be fairly easy to find cat-inspired paintings to give as gifts. If your budget doesn’t allow you to buy fine art, consider giving an art print or a poster of a famous cat-inspired painting. If you need more ideas to help you select the perfect gift, please read on. Leonardo Da Vinci's Virgin and Child with Cat (AD 1478-81): This is a drawing of the Virgin sitting with the Christ Child on her lap. The Christ Child is holding a cat. The cat is twisting, trying to slip free from the Child’s grasp. Unfortunately, no painting based on the Virgin and Child with Cat sketches survives to this date. Interestingly, there’s a Rembrandt etching also entitled Virgin and Child with a Cat (1654). The etching showcases a cat with Mary, Joseph and Baby Jesus. For more on cat drawings, go to our cat drawing page. Francisco Goya's Don Manuel Osorio de Zuñiga (1787): This painting shows a little child holding a bird with a cord around its neck. Three cats sitting nearby closely watch the trapped bird. You can find an art print of this painting at several online art stores. Pierre-Auguste Renoir's Julie Manet with Cat (1867): Cats appear in several of Renoir’s paintings. This painting is an example of his affection for felines. Edouard Manet's Woman with a Cat (La Femme au chat) (c. 1880-1882) portrays the artist's wife with their cat Zizi. Temptation: This painting depicts a cat scratching the back of a chair. How feline…This painting is available as an art print. Contentment: This is another beautiful work by Ms. Ronner-Knip. It portrays a mother cat with her kittens. It’s also available as an art print. Caged Kittens: Several kittens play in and around their cage under their mother-cat’s watchful eye. Picasso was apparently fond of cats, as evidenced by his several cat paintings. His cat-inspired paintings include Still Life with Cat and Lobster (1962) and Cat and Crab on the Beach (1965). By the way, you can also find many interesting works of abstract cat art. If you want a unique take on cats, look for abstract cat-inspired art. Other famous artists who painted cats include: Raphael, Bonnard, Matisse, and Andy Warhol. British artist Marilyn Robertson also paints cats. Her cats are fun and jazzy. And one of my favorite contemporary artists is Hu Chen whose paintings of cats are exquisite and evocative. A favorite painting of mine is Henri Rousseau's Surprised!, which depicts a startled jungle cat. Looking for more contemporary artists? Rachel Parker's watercolors of cats make great gifts for cat lovers. Go to her virtual studio. Mia Lane's cat paintings will absolutely delight any cat lover. To see her animal paintings, you may visit her site http://www.mialane.on.ca/. Cat paintings make gorgeous cat lover gifts. Of course, the originals of many of the works named here and others are not available to the public. Some are in museums while others belong to art collectors. However, many of these works are available as art prints. Many online stores offer them and you can even have them framed for an extra fee. For additional cat print ideas go to our page about cat prints. --Give a poster of a cat painting. This is an alternative to buying an art print and is far less expensive. --You can also give a calendar showcasing cat-inspired paintings and other works, such as cat drawings or etchings. --Cat portraits are very popular these days. What’s better than a painting of your own cat? This makes a great cat lover gift idea. --Create your very own painting. 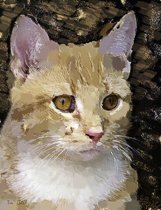 If you enjoy the arts, would like to take a class, or pursue painting as a serious hobby, why not make your own cat painting? See below for more ideas and inspiration. --If you absolutely must have an original painting, here's a great resource for you: www.lesliestones.co.uk , where you can find limited edition, cat art prints by Leslie Stones. You may also visit www.greetingcarduniverse.com/lesliestones, where you can buy Leslie's greeting cards online. And at http://www.zazzle.com/lesliestones you'll find great products featuring Leslie's artwork. Here a few lovely Chinese works of art brought to you in affiliation with chinesearestore.com. This is a lovely Chinese charcoal drawing. And for more information about Leonardo's Virgin and Child with Cat visit the British Museum.